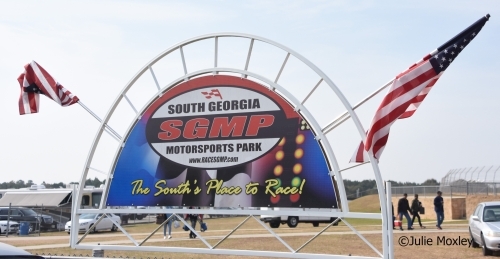 The 40th Man Cup World Finals sponsored by Mann Hill Garage took place at South Georgia Motorsports Park, Valdosta on 9th-16th November 2016. 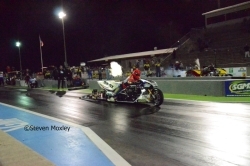 The final round of the 2016 Man Cup Series turned into a unique event, with the wedding of former ACU Champions Kevin Charman (Top Fuel Bike, Funny Bike and Comp Bike) and Lizz McCarthy (Comp Bike) taking place on the start line of the track. 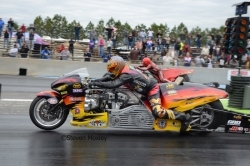 It took place just before the start of the opening qualifying session of Top Fuel Bike. 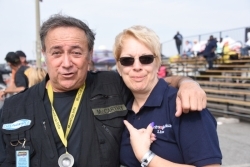 Jay Regan from MRE gave Lizz away. This was the first wedding to have taken place during a Man Cup event. 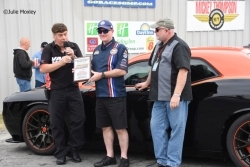 The other news was that parts suppliers DME signed up to sponsor an All Star Shootout in Pro Street, with the eliminator starting on Thursday. Sam Wills had a slender lead of nineteen points coming into this event ahead of Larry McBride. 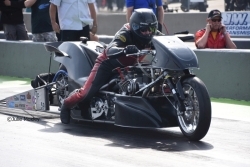 McBride ran 5.838/247.29 (number one qualifier) in the opening session at the expense of a damaged valve (new motor fitted for the next session). 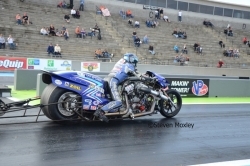 McBride damaged another motor on Saturday. 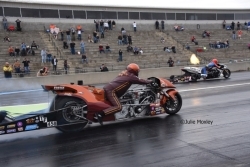 Dave Vantine ran 5.93 in testing before the event and ran another 5.939/230.76 for number two spot. Korry Hogan ran 6.022/238.47 with the sump leaking. The next pass a bolt broke on the blower pulley. 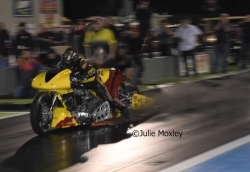 Chris Hand had engine issues and changed motors after qualifying with a 6.306/183.17. 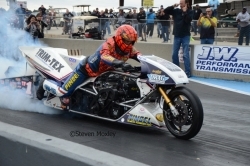 Top Fuel Harley rider Mitch Brown was doing licence runs on Dennis Bradley fuel bike. 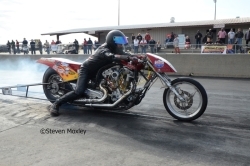 Wills constructed the bike, Mike Dryden, did the fuel system and Brown constructed the billet cylinder head. Brown qualified with a 7.213/141.02. Sam Wills had a weekend to forget. He overpowered the track on every run in qualifying and changed the motor for the final session running a best of 9.044/134.75. The first round saw McBride against Wills to decide the title. 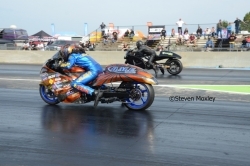 McBride hooked up and was gone (6.050/245.09) while Wills smoked the rear tyre again and did a controlled quarter mile burnout to a 11.739/117. 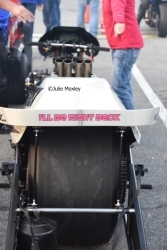 Vantine had a bye 5.864/238.17 after Brown was a no show due to a broken transmission. There was drama in the last race Hogan against Hand. Both launched well but at mid-track a con rod broke on Hogan’s motor coming out through the sump and dropping oil in front of the rear tyre. 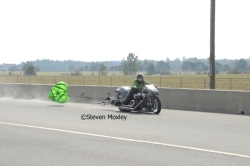 The bike leaned at the 1000 foot mark and hit the wall in the shutdown area, burst into flame and the went across to the other lane hitting the wall. Hogan was taken to hospital and was OK and returned to the track. 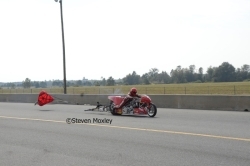 Hand (5.916/226.16) was ahead when the bike crashed. McBride had a bye to the final and smoked the tyre off the start line. Vantine ran low et of the event 5.795 to beat Hand 9.091. 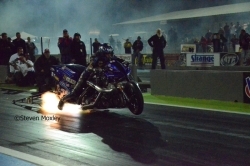 In the final McBride won the event 5.990/234.09 and the Championship when Vantine smoked the tyre off the start line. 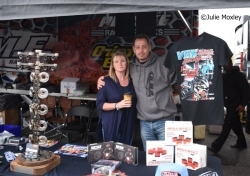 Tracy Kile made a last minute decision to come to this event and do some testing for the new fuel bike he is building for 2017. Kile ran a 6.550/206.26 for number one qualifier. 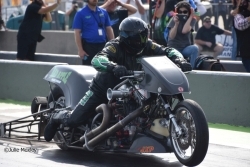 Takeshi Shigematsu ran 6.561/208.71 on his Pro Charger V-Twin. 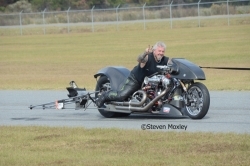 Next up was Jim Page on a new bike and ran 6.640/202.00. Billy Jack was riding the ex-Jim Fagin bike that Mike Romine delivered to the track. Jack got very close to the wall in the shutdown area during the second qualifying session with a 6.697/205.85. Tadashi Saito only got his bike three days before the event and did some shakedown passes to a best of 8.766/143.90. Both fuel bike classes suffered rear tyre chunks (holes) on nearly every run as the track prep had been very good. Kile had a bye run and ran low ET of 6.503 at 211.13. Page ran Personal Best figures of 6.594 with a top speed of the meet 217.49 to beat Jack 9.875. Saito had a problem in the staging lane and Shigematsu solo 7.749. The semi-finals had a great race between Kile and Page. Kile put a holeshot (reaction time of 0.035 to 0.116) over Page and held on to the win 6.755/169.98 to a quicker but losing Page 6.740/203.80. 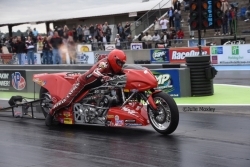 The final was another great race Shigematsu with pro-charged motor against Kile's normally aspirated bike. Shigematsu put holeshot (Reaction Time of 0.038 to 0.096) over Kile and took the win light 6.529 with a p/b speed of 215.48 (with this new combination) to Kile's quicker but losing 6.524-189.79. There was plenty of excitement in the opening qualifying session with two of the quickest runs in the history of the class. 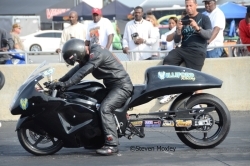 Kirby Apathy ran 7.071 at 180.28 to become the quickest Pro Fuel Bike. 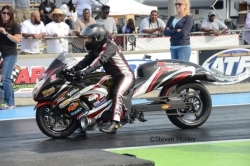 But that didn’t last long, Michael Ray riding Johnny Vickers bike ran 7.063 at 179.85 to become the unofficial record holder. Apathy ran 7.11 in a later pass to become the record holder. Jannette Thornley was the next rider with 7.324/176.84. 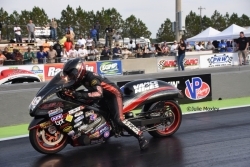 The Championship was decided in round one as Championship points leader Tyler Wilson got knocked out by Apathy and Cliff Holley ran Personal Best figures 7.347/179.02 to beat Rocky Jackson, meaning Wilson was the Champion. Jordan Cruz had problems in qualifying, but come race day everything went well and he reached his first Man Cup final. Ray took the win light in the final and ended Cruz day 7.324 to 7.638. The final of the Rockingham meeting was run during qualifying. Terence Angela, who only managed to qualify eighth with a 6.933/210.11, beat Rodney Williford who was the number one qualifier with 6.782/217.00. Just ahead of Mark Paquette 6.791/214.48, Ehren Litton 6.794/218.83 top speed in qualifying. Joey Gladstone was just behind in fourth 6.828/213.23. 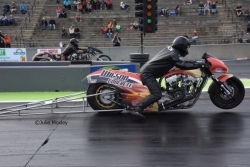 Eleven bikes qualified in the six-second zone with Jordan Haase 6.966. 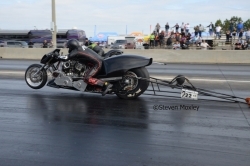 In round one of eliminations Brad Anassi's bike fishtailed at three-quarter track when racing against Ryan Hable. Anassis parted company from the bike when he hit the wall, but fortunately he was OK. 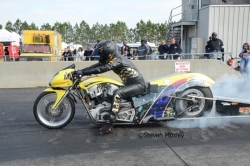 Pro Street eliminator was finished on Monday. Gladstone beat Angela in the semi-final 6.847 to 6.882 to win the Championship. Jeremy Teasley beat Paquette in the other semi-final 6.954 to 7.096. Gladstone won the event when Teasley was a no-show in the final. Twenty nine bikes entered the DME All-Star Pro Street Shootout and there were a few Personal Bests set during qualifying and eliminations. Rodney Williford was the number one qualifier 6.760-217.88. 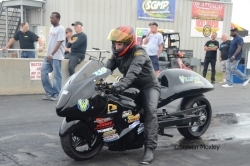 Ehren Litten was just behind with 6.769 with a top speed of 221.60. Mark Paquette was in number three spot 6.826 at only 198.35. 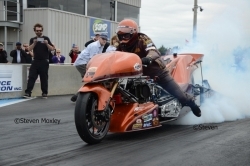 Round one and Paquette ran a jaw dropping 6.707 at 211.63 (quickest ever run by a Pro Street bike) to beat Tony Ficher. Paquette had to change his motor and lost in the next round. The final was between Williford and Litten, which was decided on the start line when Williford spun the rear tyre and Litten was gone, storming down the track and taking the win light 6.81. Litten collected $10,000 for the win.